Info "Thank you for shopping with us. We look forward to serving you again tomorrow. Close the shutter when the last customer has left. Quickly!" Closing Time is one of Mona's microgames in WarioWare: Smooth Moves. 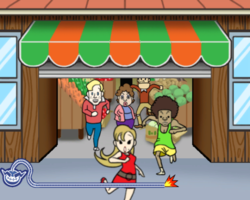 The player must close down the store, but after everyone who was running out has already left. If the player closes the door at the wrong time, the player loses. 1st level difficulty: People will simply run out. The store must close after they are out. The image on the garage door will be a tomato and it will grow limbs if completed successfully. 2nd level difficulty: People will run out, but an employee will run in. The store has to close before the employee makes it back in. The image on the garage door will be an egg and a chicken, and the egg will hatch and they will look at the player if completed successfully. 3rd level difficulty: People will run out, but employees will run in, and someone who has already ran out will attempt to run back in. The store has to close before the employees and person come back in the store. The image on the garage door will be a moon and a house and they will shine if completed successfully. This page was last edited on February 19, 2018, at 17:03.